IPod Touch 5th Generation-Silver (16GB) Model #A1509. Very Light Wear, Good Battery, Works Well. Apple iPod touch 5th Generation Blue (16 GB). Condition is Used. Shipped with USPS First Class Package. Apple iPod touch 5th Generation Silver/Black (16 GB). Condition is Used. Shipped with USPS First Class Package. Apple iPod touch 5th Generation Silver/Black (16 GB). Condition is used with scuffs/dings on back (see picture) otherwise functioning fine. Comes with cable and charger. For sale is my ipod touch 5th generation in blue. Apple iPod Touch 5th Generation Pink (16 GB). Condition is Used. Shipped with USPS First Class Package. Money back guarantee! Free shipping with accessories! New ListingApple iPod touch 5th Generation White (16 GB) MGG52LL/A - Free shipping! Very good condition. Display is clear with no scratches. Sale includes one iPod, case, original ear buds, and generic lightning cable. Factory reset to default. IPod touch is in great condition. Needed to replace with larger iPod. New ListingApple iPod touch 5th Generation Space Gray (16 GB) - Free shipping! Very good condition. Display is clear with no scratches. See pictures of back. One is a generic picture, the others show where labels were removed. Sale includes one iPod and generic lightning cable. 4.5 out of 5 stars - Apple iPod touch 5th Generation Space Gray (16 GB) - Free shipping! 137 product ratings137 product ratings - Apple iPod touch 5th Generation Space Gray (16 GB) - Free shipping! Apple iPod touch 5th Generation Yellow (16 GB). Condition is Seller refurbished. Shipped with USPS First Class Package. Pics are of the device. IPod Touch is used but in great condition - everything work - no major scratches or dents. Trending at $60.00eBay determines this price through a machine learned model of the product's sale prices within the last 90 days. Apple iPod touch 5th Generation Blue (16 GB) Bundle. 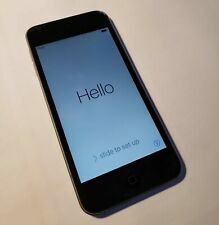 IPod touch 5th generation 16gb (Silver ). iPod has been fully tested and found to be functional,no issues. good conditions as you can see in the photos. Refurbished iPod in Very Good condition. You're getting a great device at a great price! Great Value. Apple iPod touch 5th Generation Silver/Black (16 GB). Lightly used, good battery life. Factory reset. Includes a lightning to USB cable and used earphones. IPod Touch A1509 16GB. Conector lightning. Up for sale is an Apple iPod touch 5th Generation Space Gray (16GB). The iPod is fully functional and works great. - The iPod is NOT linked to an Apple ID and has been reset and ready to go. A few of the scratches on the screen are easy to see. Reset to factory settings. Ready to use. Apple iPod Touch 5 thGeneration IOS 16gb Silver. T h e u n i t i n t h i s a u c t i o n i s l o c k e d b u t a l l k e y features w o r k. A l l t h a t i s i n c l u d e d i s t h e u n i t i t s e l f.
Refurbished iPod in Good condition. You're getting a great device at a great price! USB Charging Cable. The item doesn't include original box.